Slither.io is a snake and io games combination. You start as a tiny snake and eat all you can. Once bigger, try cutting off other smaller snakes to grow exponentially bigger. The beginning is very difficult since there are very long snakes out there and if you run into them – you are done. 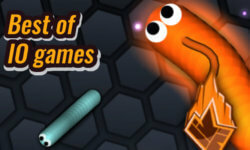 This is the most popular IO game after Agar.io and has a lot of players and competition.